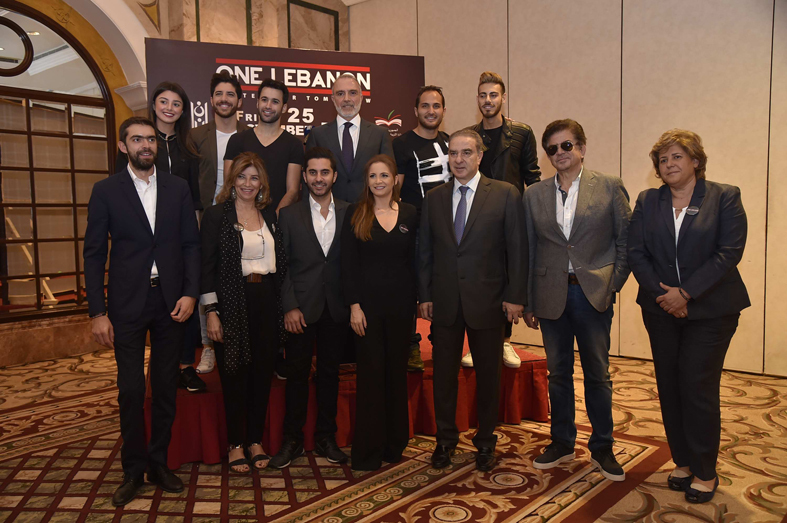 For the third year in a row since its establishment in 2014, ONE LEBANON has officially announced its upcoming Annual Solidarity Concert that will take place on Friday, November 25 at BIEL during a Press Conference at the Phoenicia Hotel that gathered Minister of Tourism Mr. Michel Pharaon, ONE LEBANON Founder & President Soprano Tania Kassis, Spanish Ambassador Milagros Hernando, some celebrities that will participate in this year’s concert like Walid Toufic, Nizar Francis, Anthony Touma, Silvio Chiha, Maritta Hallani, Pierre Rabbat, Marc Hatem, Omar Dean and Ghady Bechara, ONE LEBANON Board Members, volunteers, friends and supporters. The date of November 25 was deliberately chosen by ONE LEBANON as a celebration of Lebanon’s independence and the theme chosen is a message of hope targeting the youth; yet inclusive of all the Lebanese generations. Tania Kassis mentioned that this year’s concert profits will be offered like every year to the children of the Lebanese Army Martyrs.